Afghan rugs are a beautiful piece of cultural heritage from Afghanistan. Today, we’re going to have a quick look at what they are and why they’re special. Afghan rugs, as one might expect, traditionally come from Afghanistan. Nearly every village or tribe has its own designs and fashions when it comes to rugs, but for the outside consumer, the rugs you’re most likely to meet come in two different flavours: those from the Turkmen minority who live to the north by the similarly named Turkmenistan who reside in the west and south west of the country by the border of Iran. 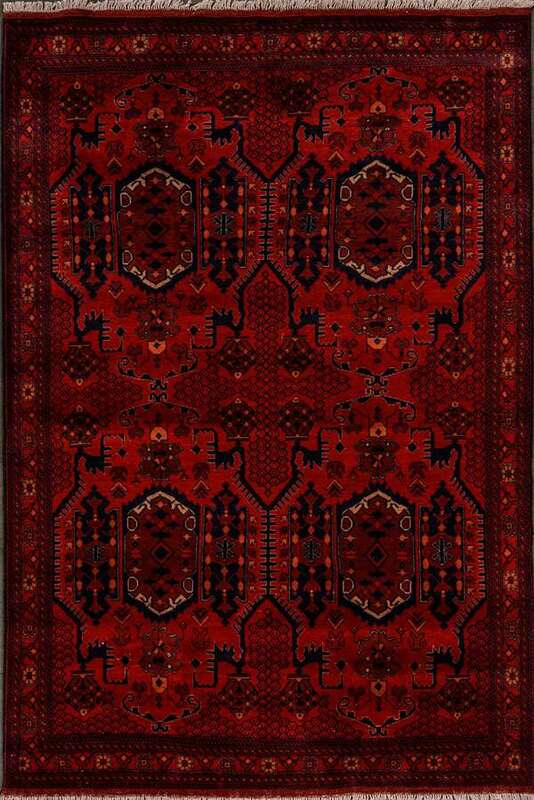 Turkmen rugs are visually distinct by their typically rich, red colouration and fantastic patterning. Thick and with distinctive symbology, they are an expression of diligence in craftsmanship. 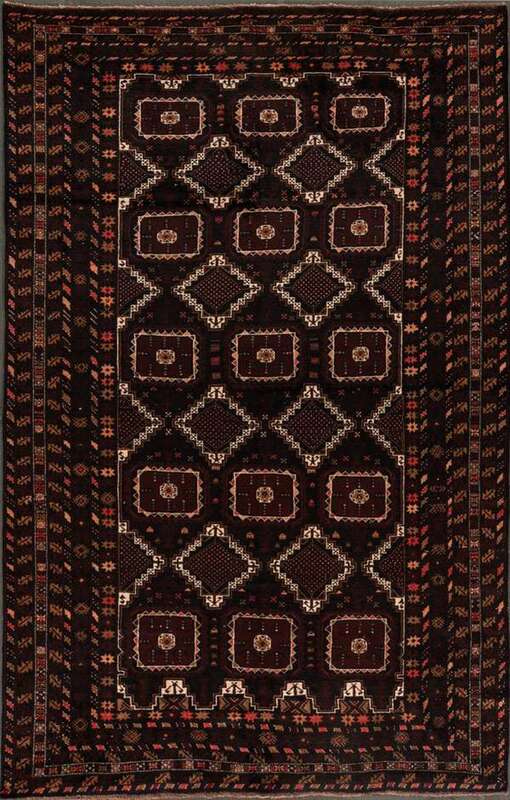 The Baluch (Ba-loo-k) are recognisable by their darker, slightly more sombre colouration (though they certainly don’t lack in their geometric patterns and are most well known for their prayer rugs). Their patterns are driven by deeply personal meaning, but they do feature similarities – the most commonly featured motif being the octagonal Bukhara, or elephant’s foot. The brilliant hues that feature prominently in such rugs are from the same sources as they have been for generations – natural dyes. 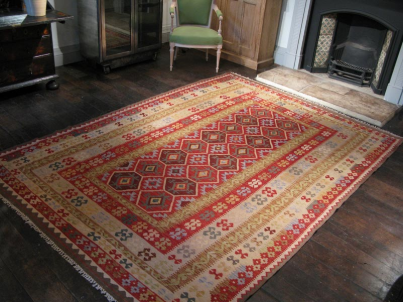 The rarity and price of synthetic dyeing technology means that the Afghan rug has kept its rustic charm, as its colours are derived largely from plants like madder, sparak and pomegranate and other natural sources. The rugs are made entirely of wool – traditionally the most easily acquired textile material, which after shearing, is spun into three different varieties of thread, known as the warp, weft and knot. Long warp threads form the framework, then the weft and knot threads pull it all together in a extremely time intensive weaving process. The work required is so intensive that it is believed it requires 12 hours of hard work to produce just 30.5×30.5 of carpet. Perhaps even more incredible is that the designs are woven in line by line, to a design held entirely in the weaver’s mind by memory over a period of weeks to months. Truly incredible stuff. The designs have evolved over time, reflecting the changes of the world. Starting during the Soviet occupation in 1979 and continuing to the modern day, Afghans wove poignant and powerful images of what they saw in every-day life into what are called war rugs. It’s a shows the effect of such conflicts on a culture and how things have changed. Not just for the decorations, but for the weavers themselves as well.